What makes an ultimate survival rifle? From my perspective it is a light-weight bulletproof all-weather manual cycling Mauser actioned rifle chambered in a cartridge versatile enough to take everything from small to large game. Personally, my survival cartridge of choice has been the .357 Magnum because it offers so many power options from light sub-sonic .38 Special loads all the way to high grain big power .357 Magnum loads. This is a feat which simply cannot be accommodated in modern semi-auto rifles or many other cartridges. Shoot a rabbit with a .223 or .308 and you have a big mess on your hands, not to mention it will be significantly louder. Downing a dear with a 22 is doable, but much more effective and humane with the .357 Magnum. The obvious versatility of being able to shoot either .357 Magnum or .38 Special rounds from the same gun are a huge plus in both everyday shooting and also in a survival situation where rounds may need to fabricated or scavanged. For small game, cast semi-wadcutter rounds will pass though small game and not destroy meat and the same round is effective enough to pass through a deer shoulder for a kill shot. Other options such as .357 Magnum bird shot work phenomenally for close range bird and snake hunting and rodent pest control. Not to mention the .357 Magnum round comparatively is cheap to 44 mag, .40 and other ballistically similar “Magnum” cartridges and is of course less expensive than semi-auto rifle calibers. The .357 Magnum/.38 special caliber can be loaded so lightly they are slightly louder than a decent fart and is also very easy and forgiving to reload unlike semi-auto cartridges. Primers and powder can be scavenged from any cartridge from .380 to .40 to create a load. Even 158 Grain cast bullets are a little more lead frugal than the other obvious 44 Magnum rounds and unless you are loading them really hot, do not require a gas check which is another component you may not have available. In my mind pistols and rifles chambered 357 Magnum are very versatile guns that can fill many roles. To say I was thrilled when Ruger introduced the lightweight 77/357 chambered in .357 Magnum, well ... my enthusiasm could not be measured. The Ruger 77/357 is based on the rugged time tested and proven modified Mauser style Ruger 77 design currently offered in a number of calibers from .17 to .44 Magnum. 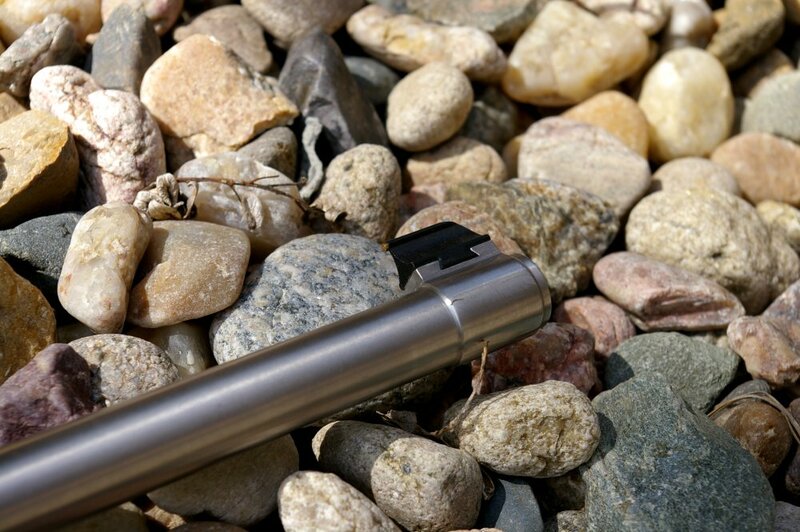 The design is infallibly simple and is the epitome of all- weather durability in all stainless with a synthetic stock. The bolt design operation makes it a great rifle that can take huge amounts of abuse and continue functioning. The Ruger 77/357 features the same three position safety found throughout the 77 line which allows for fire, safety with bolt manipulation and a third position which locks both the firing mechanism and bolt. This third position is an important safety feature for those who like to carry a live round in the chamber at all times when hunting. As with all Ruger firearms the 77/357 is well made, tightly fit and finished in a beautiful brushed stainless finish and the stock mats perfectly to the barrel and action. If you are familiar with any of the Ruger 77/44 or 77/22 rifles, you will see the same fit and finish in this rifle. The 77/357 is a solid but feathery 5.5lbs and a short and handy feeling 38.5” long length. These traits are what make the rifle very fast handling perfect for dense woods hunting. The 77/357 could be easily carried on an all-day fall hunt and could be used to fill limits on anything from squirrels to deer without the need for a second gun. I have to say this gun screams "I am ready for anything, toss me in the back of the truck and let's go hunting and/or shooting". Although being a fan of the 77 Series, this is the first I have had my hands on long-term and you realize this is truly a gun your great, great, great grandkids could still be shooting and with a scotch brite pad buff could look as good then as it does now. The trigger feel was fairly crisp with little take up, however it was a fairly heavy trigger pull which is what I would want in a rifle I may be pushing through brush with. Obviously the 77/357 is based on the proven Mauser style Mark 77 Ruger action which locks up dependably like a bank vault, tightly, and functions quickly and smoothly. The sights are the same durable and dependable brass bead front and flip down adjustable rear sights found on the 10/22 to 77 Series rifles. 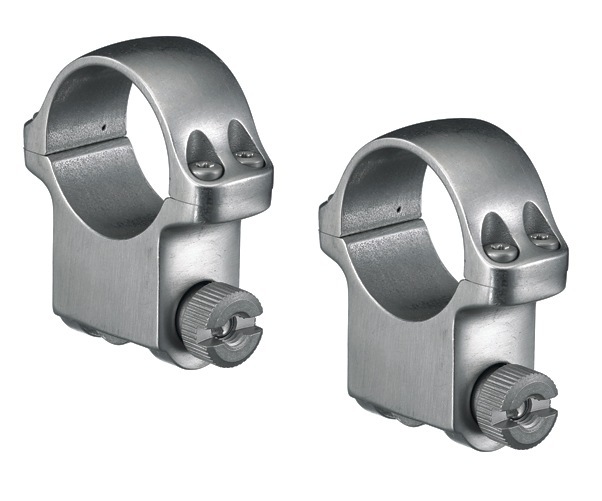 The rugged sights are not fancy, but are durable and do a great job. The weatherproof cold hammer forged barrel is a 18.5” stainless 8 grooves with a versatile 1:16 RH twist that provides good accuracy through a variety of .38 special to .357 loads. Of note, most of the .38 Special and .357 Magnum rounds will pick up a little zip. According to Ruger, they tested a Hornady 140 grain FTX loads and clocked them at over 1820 feet per second out of the 18.5" barrel which makes for a very hard hitting round. Wood stocks can break and typically are heavier than synthetic stocks. One thing I really liked about the Ruger 77 series synthetic stocks are their cavernous buttstocks. 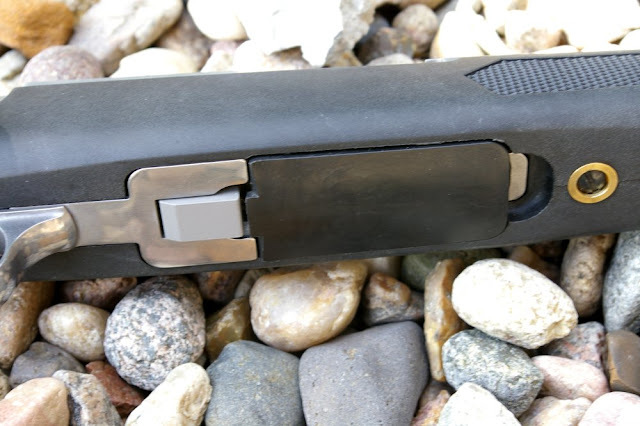 The rifle’s buttstock can hold a huge volume of survival accessories including the 5” Fallkniven survival knife and UCO Stormproof Matches shown and still have loads of room left for other items and extra ammo. I only wish Ruger had made the buttpad and grip cap quick release for easy access to stored items, but that may be a future modification. 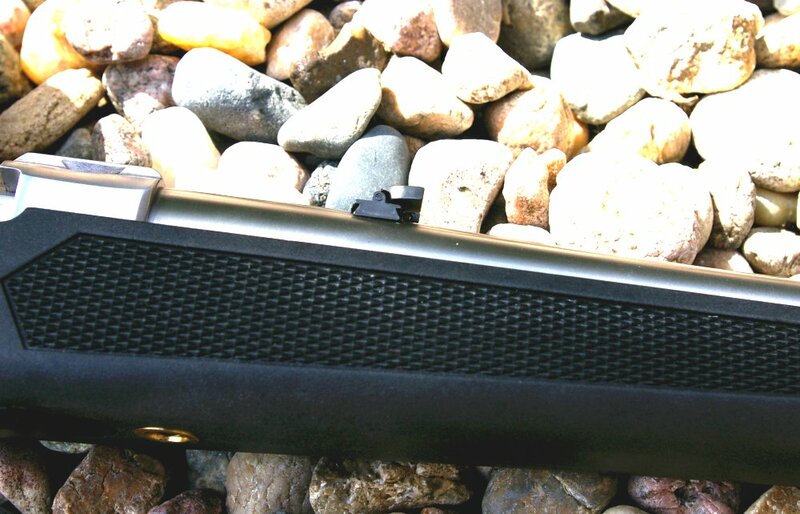 The five-shot rotary magazine is the other great feature which proved itself by feeding magazine full mixtures of 38 Special and 357 Magnum loads. 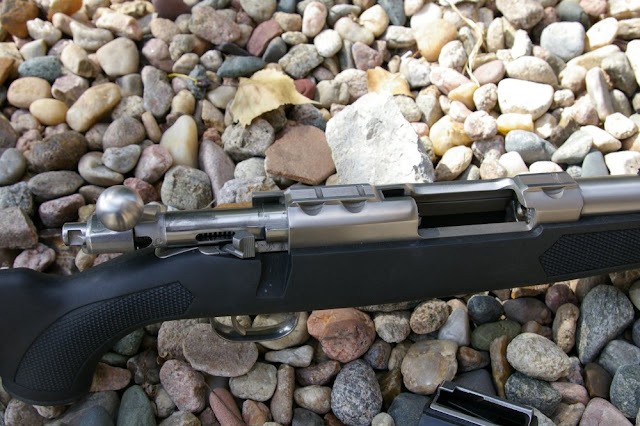 I do wish someone would come out with high capacity magazines such as those found on the 10/22 and 77/22 which share the same rotary magazine design. Out of the box the magazines did not drop free and required a little finger wiggle however I have noticed in the last month that with use, the magazine is beginning to be easier to release. Some would argue they want a drop-free magazine and others would argue against. I think the magazine will “break-in” and loosen up however I do not see it becoming a quick reloading rifle like the 10/22 without a few edge radius and contact point tweaks to the magazine and receiver. Please someone... a 10 rounds drop free magazine, I beg you. An advantage over lever actions is that this gun can be quickly loaded and unloaded just by clearing the chamber and dropping the magazine. Ruger is now including a set of "high" 1” stainless steel scope rings, a $80 value, with the 77/357 which mount to Ruger’s proprietary scope mounting system. If you are mounting up a 1” scope you are ready to go, but if you will be using one of the popular 30MM tubed scopes, you will need to pick up a different set of rings. The Ruger 77 series has been so prolific that there are a variety of mounts available for the Ruger 77 scope mounting points including bolt on Peep rear sights, Weaver Rails, and even bases for most popular red dot optics such as the Burris Fast Fire II. Even in the midst of an abundance of crap and crud, this is one action which will continue to shoot regardless of the environment. The gun was never cleaned throughout testing and I never had a funcitoning bobble. When most of use think of a survival rifle design we think of bolt actions that can take the muck and still function. Of course with any bolt action, the force and speed of the “action” is all up to the shooter so if you happen to want to shoot a handload 38 Special gallery round (minimally loaded sub-sonic pest round), you can load that in the magazine right before a full power .357 load. Also if you need to hammer in or out a sticky round you have that option with the bolt action. 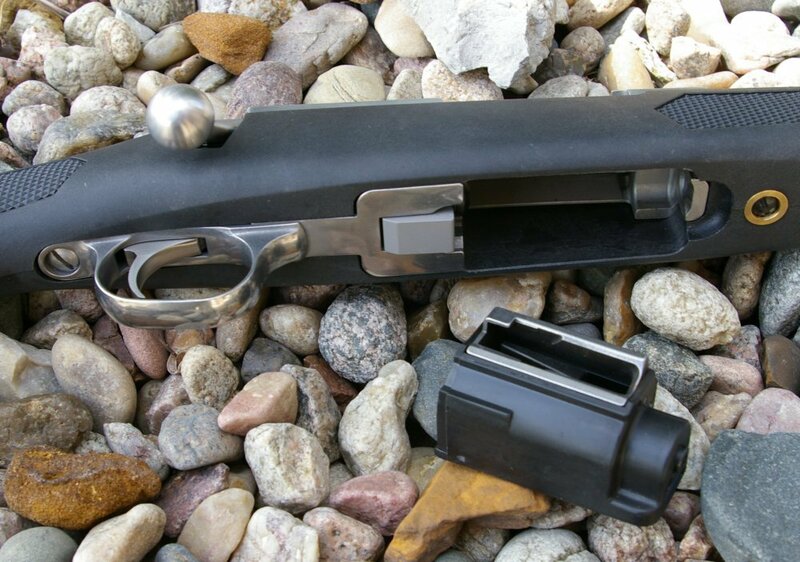 The Ruger 77/357 was tested both with the stock iron sights and with a Trijicon 1-4X optic. The proprietary mounts did require the purchase of 30mm new rings instead of being able to use the 1” rings included or the weaver/picatinny ring already mounted on the scope. 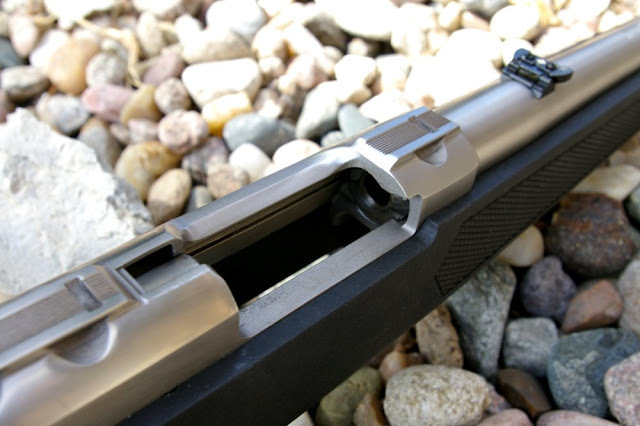 I understand the Ruger mounts can take an incredible beating, however I have to ask if there a reason it is not drilled an tapped to accept a bolt on Weaver base? To be up front I did not spend a day drilling 100 yard targets, I spent about an hour total on it, because being a high precision 1 MOA rifle is not what this gun is about.. and frankly I was having more fun shooting 25-75 yard targets offhand. Also I will apologize for the lack of target and range shots, my media server went toes up and I lost all my pictures and had to do a re-shoot just as I was finishing the review. I will post new ones when I have time to recreate the testing setup. For accuracy testing I used Winchester Super-X White box .357 Magnum 158gr JHP, Winchester .357 Magnum Partition Gold 180gr JHP, and my own .38 Special 158gr FMJ and HP reloads. The accuracy was no surprise to me and netted solid 2” or less 10-shot groups with all ammo off a rest with open sights at 50 yards. At 100 yards those groups opened up to 5” with iron sights which I still consider minute of deer accuracy with iron sights. The Trijicon 1-4X scope setup is about the perfect optic solution for the 77/357 and allowed plenty of field of vision on the 1X setting for close shots and at 4X helped me dial most groups into the 2” range on the 100 yard range. This gun actually liked the inexpensive Super-X .357 Magnum rounds the best and I managed one 1.7” 3-shot group at 100 yards with the optic on 4X. Not a precision sniper rifle however a good performing rifle for its design intent and cartridge limitations where most shots will likely occur off-hand in the 10-50 yard range. Then I set up my favorite 25 and 50 yard critter sized targets.. golf balls and remembered why I love a good bolt action. It makes you slow down and think about each shot. If I were going to outfit this gun as a survival rifle (which I will), there are a couple features I wish the gun did have such as: An integral Weaver/Picatinny scope base, a true drop free magazine, adjustable peep rear sights, hooded/eared front sight, a 16.1” threaded barrel to allow for easy suppressor attachment, higher capacity (10-round) magazines, and of course a quick release buttpad to get to items stored in the buttstock. With these changes of course you would be looking at more of a Mini-Gunsite Scout rifle, however for around a street price of $500 even in the current state the Ruger 77/357 is outstanding and both a tough gun to beat and once that will take a beating. The Ruger 77/357 is an outstandingly durable rifle package which carries on the Ruger 77/44, 77/22, and 77/17 legacy. Several years ago the 77/357’s bigger brother the 77/44 was suddenly discontinued and we all though that great line of Ruger guns was about to be retired. 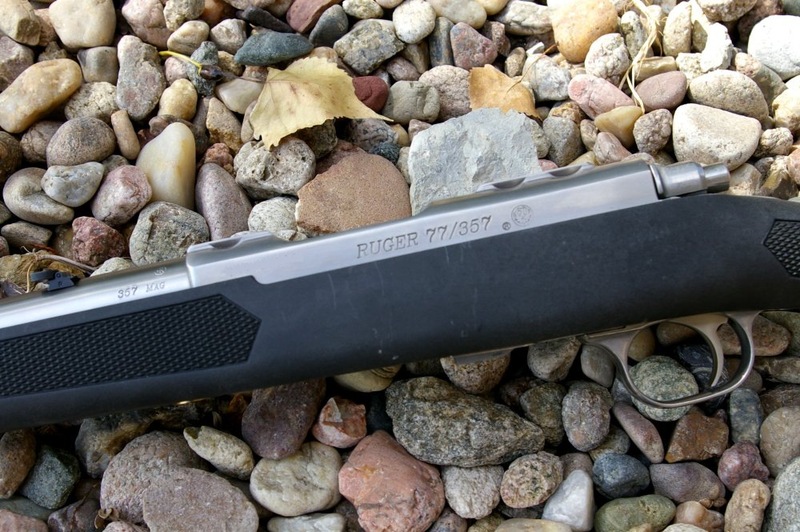 Apparently the public outcry was big enough that Ruger not only re-introduced the 77/44 model, but also added the 77/357 as well and I for one could not be more happy. From a all purpose hunting, disaster preparedness gun, and extended survival rifle the gun is hard to beat. Pair this with a Stainless 4" GP100 in .357 Magnum and you have an outstanding survival combo. 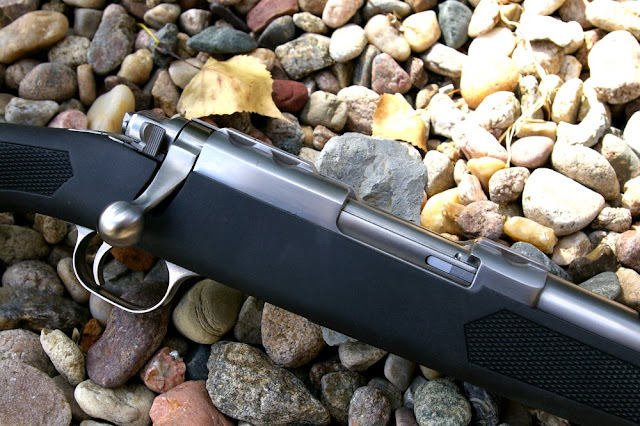 Short handy light weight and with the stainless and synthetic stock the gun is literally impervious to the elements. With the bolt feed action is also provides the user problem free feeding of a limitless array of production and handload .38 special and .357 Magnum rounds. Personally I love the gun and have had a great time shooting this gun Ruger provided the review. A check will definitely be going to Ruger shortly for the gun so I can add this to my permanent collection. Catalog Number: K77/357-RSP | Model Number: 7405 | Caliber: .357 Mag. 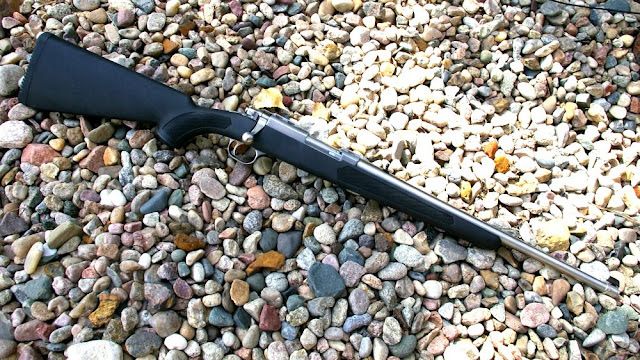 Barrel Length: 18.50" Overall Length: 38.50"
Capacity: 5 Weight: 5.50 lbs. Thank you, Sir, for this well-written and informative review! Very intriguing little rifle. I hope that it catches on and an aftermarket accessories become available. I like the idea of a higher capacity magazine but I could live with the 5 rounders if they made some good pouches to carry some extras in. I'm not typically a big fan of synthetic stocks but I'll reserve judgement until I get my hands on one of these. I don't think U are going to fine this rifle selling for 500 any time soon. Good review. If it had a Mannlicher synthetic stock and a 10rd stripper clip feed it would be the perfect survival fifle. Otherwise, a great review of an intriguing weapon. Many good points about the .357 and the all weather bolt action. Why the heavy trigger pull? Fills a niche better than the Remington-owned Marlin.